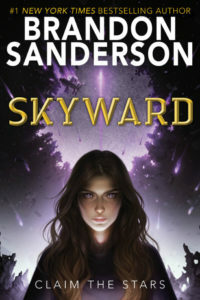 Skyward is the first (and so for, only) book in Brandon Sanderson’s newest YA/adult crossover series. I was worried that it wouldn’t be as good as some of his other work because I found his previous YA series (The Reckoners) a little weak, but I pre-ordered it the minute I saw it was available anyway because he’s is one of my favorite authors and even a mediocre book from him is a lot of fun. The book is set on Detritus, a planet where a human fleet crash-landed a few decades ago but can’t leave because of constant attacks from mysterious aliens. It is told from the first person viewpoint of Spensa, a teenage girl who wants nothing more than to become a fighter pilot and repair the legacy of her father, who was branded a coward after he fled during a pitched space battle. I’m a big fan of coming of age stories that involve the underdog protagonist going to an exclusive institution and excelling despite the odds. I also enjoy the “dragon rider” trope. Skyward is a mashup of these two sub-genres (albeit with a sentient starfighter instead of a dragon) and I loved every minute of it. All of Brandon Sanderson’s books are cinematic, but this one was even more so because there are so many great depictions of fighter pilots already in movies and TV (my imagination drew especially from Top Gun and Battlestar Galactica). It takes its time in building an immersive world but never takes its foot off the accelerator. Spensa starts off (like most teenagers) very sure that she knows who she is and what she wants to be, but going from living a relatively safe life to being on the front lines of a war means that she doesn’t get to hold on to her illusions for very long. I really enjoyed seeing her grow and gain the skills to back up her initial bluster. I wish M Bot (her starfighter) had been developed a little more, I think the idea was to make him seem broken and somewhat naive, but he came off mostly just as juvenile. To be fair, he didn’t have a lot of page time; I assume that his character will be explored further in later books. I was both satisfied in the end and impatient for more because Skyward does a great job of both telling a complete story and opening up a bunch of new questions. I’m glad that the next book (Starsight) is coming out this year, even if I have to wait until fall to read it. This entry was posted in Books, Reviews by Kriti Godey. Bookmark the permalink.